As with most types of hunting, thorough scouting before the hunt is an important element to success in turkey hunting. Hunters who do their homework beforehand dramatically increase their odds of taking a turkey. Here are some key tips for scouting turkeys that will give you the advantage on your next outing. The first step in scouting for turkeys is understanding the property you will be hunting. Use maps and visit the area to get an idea where turkeys might be located and what their movements will likely be, given the terrain. When you begin scouting the property in person, it is best not to tromp around the property and spook the birds. Instead, stay on the edges of the property and use binoculars to get a good visual of the area, before moving in and walking around. Scout an area at the same time you will be hunting it. This will give you a good idea where the birds will be when you are hunting. If you are going to hunt in the early morning, for example, do your scouting in the early morning, so you can see where the turkeys are moving from their roosting areas. Locate roosting areas by looking for feathers, dropping, scratches and other turkey activity. The best time search for roosting areas is during the daytime hours, when the turkeys are at their feeding locations. Locate the areas where the turkeys are feeding. They will likely return to the same areas for multiple days, as long as there is food there for them. Once you locate where the turkeys are roosting and where they will be moving, the next step in the scouting process is to identify a place to hunt. A large tree, brush pile or a downed tree are excellent choices, because they will help keep your silhouette hidden from the turkeys. You also want a location that will give you a clear shot at the turkeys. It is best to start your scouting a week or so before you hunt, but the scouting should continue right up until the hunt to make sure the birds are still in the same location. One of the most important elements in scouting turkeys is to use stealth. Move carefully and quietly to avoid being spotted by the turkeys. 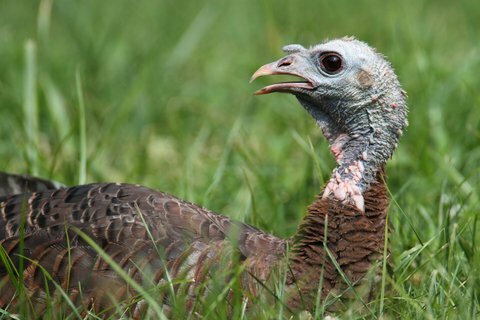 If you are spotted, the turkeys may move to a different location, which will put you back at square one in the scouting process. If you locate birds, but only see hens, do not worry. Wherever you find hens, you there is a good bet that there are toms nearby. If you are patient, you will likely see toms in the same location. Following these scouting tips will significantly improve your chances for success during your next turkey hunt. Remember that turkeys will follow similar routines day after day, so scouting gives you essential information that will help you decipher their movements and put you in the best position to bag a bird.